Home Christmas Desserts The Most Delicious Christmas Desserts Marrickville Has To Offer! The Most Delicious Christmas Desserts Marrickville Has To Offer! Tantalise your tastebuds with the best Christmas desserts Marrickville has ever seen! Casa Del’s Christmas desserts are made with the finest and freshest ingredients. Whether your need is for gift hampers, a family or social gathering, corporate gifts or party giveaways, these desserts are a true crowd pleaser! Christmas Fruit Pudding – topped with white chocolate and decorated with holly. Chocolate Coconut Balls – Chocolate cake filling dipped in dark chocolate and finished with coconut and holly. Christmas Rum Balls – Chocolate mud balls with rum, topped with melted chocolate and holly decoration. 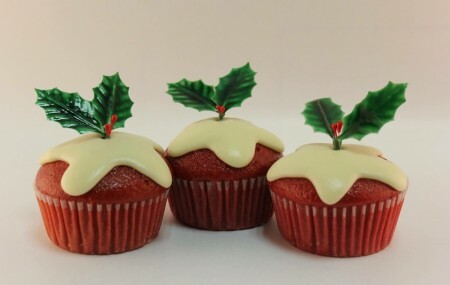 Christmas Red Velvet Cupcakes – Topped with white chocolate and decorated with holly. Mini Sticky Date Puddings – Topped with white chocolate and holly decoration. Christmas Glazed Red Velvet Cake – Moist red velvet cake with cherry cream cheese filling, topped with dripping white chocolate and festive decoration. Christmas Mud Squares – Mini mud squares with Merry Christmas message & festive decoration. Our delectable delights are ultra moist and full of rich flavour. Finished with adorable holly toppers to make them a perfect festive treat. Check out our full range of Christmas Desserts today! Casa Del Famous Rum Balls! !